If you think porridge is boring, think again. The iconic breakfast classic is hotter than ever. Our social media feeds are full of oaty bowls, each more enticing than the other and blogs are brimming with delicious recipes. There are even cookbooks dedicated to it! In my opinion nothing beats a bowl of creamy oats on a chilly autumn morning. Oats are a fantastic wholegrain to start your day as they are packed full of nutrients and also taste great too. Oats are also a good source of vitamins and minerals including thiamin, niacin, riboflavin (plus other B group vitamins), folate, magnesium, iron, zinc and vitamin E and of course a great source of fibre. But oats are not the only grain you can use, I’ve blended my oats with rye, freekeh, buckwheat, millet or quinoa amongst others. Quinoa, however is not a grain it’s a seed, flat, oval-shaped and usually white, but the colour can range from pink to black, and the taste can vary from bitter to sweet. In this recipe I’ve used jumbo oats for added texture and white quinoa. 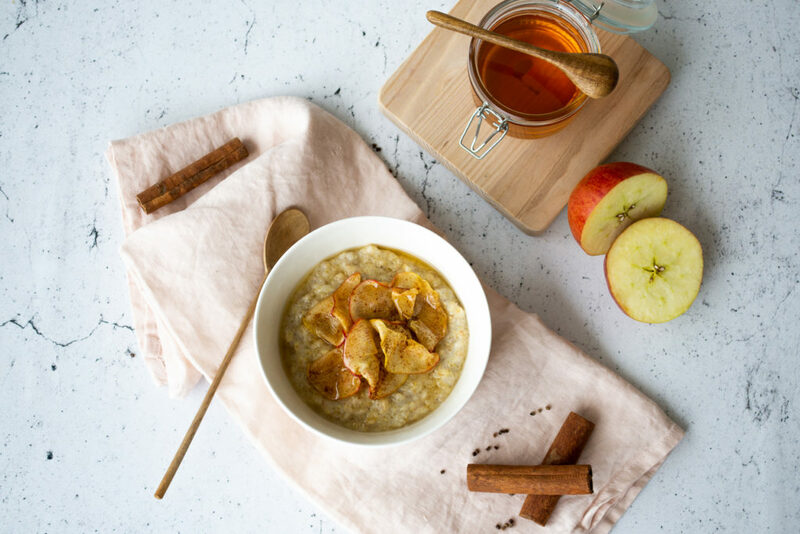 The oats and quinoa are flavoured with cardamom and cooked in almond milk, served with slivers of dessert apple cooked with cinnamon and honey, making it the perfect autumn breakfast bowl. Begin by putting the oats, quinoa and cardamom into a saucepan with the water and 100ml of milk. Bring to the boil, then lower the heat to simmer for approximately 12-15 minutes, stirring every now and then. In the mean time prepare the apples. Slice very finely, starting at the core end, so you have pretty circular discs of apple. Place into a hot non stick frying pan and cook for several minutes until they soften. Mix the honey with the cinnamon and then drizzle the mixture over the apples and cook for a few minutes longer or until the apples start to caramelise. Set to one side. Pour the remaining milk into the porridge mixture and cook for a further 5-6 minutes. 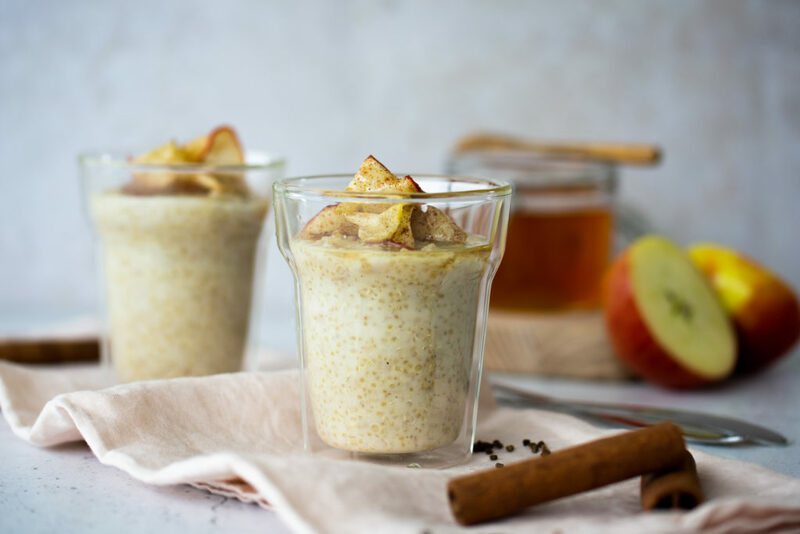 Pour the porridge into two bowls and top with the apples serve with a little extra milk and honey if desired.